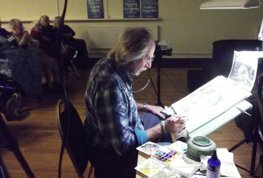 This Tuesday I drove over to Cardiff to present a Painting Demo to the SWAS. 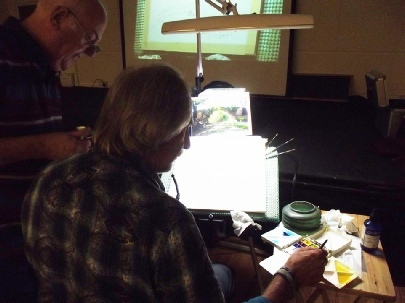 I have visited the Society on many occasions and thoroughly enjoy painting for them. 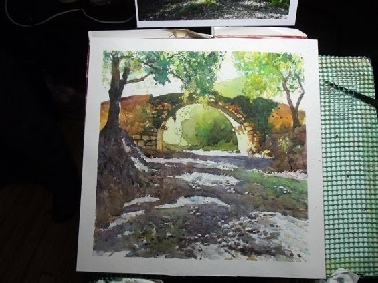 Earlier this year I went to the Greek Island of Crete and came across this wonderful old Roman Bridge tucked away on a dry riverbed...and I have been itching to paint it ever since. My demo for the evening was entitled 'Light in the landscape' and I thought this would fit the bill nicely ! Getting set up right is always a fairly lengthy affair but here is Paul putting the finishing touches to all the technical stuff. You can see my board projected onto the screen in the background. Taking a deep breath and away we go ! 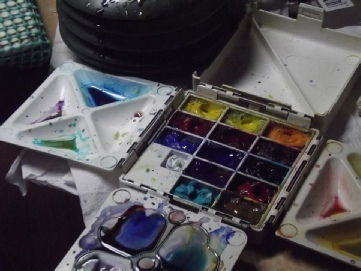 I have all my watercolour washes mixed up in the wells of my Paintbox ready to go. Once the colours start flowing it really is an exciting time as I mix all my colours on the paper and that way I'm never totally sure what will come out the other end...but who dares wins !! The beauty of having my demo filmed and being projected onto the big screen means that everyone gets a good view of my painting as it evolves. Because I paint very wet I can't have my board upright otherwise most of my colours I would end up on the floor ! It's nearly done ! Just a few more transparent washes over the foreground shadows and we should be there . Many thanks to Jude who supplied me with the photos. 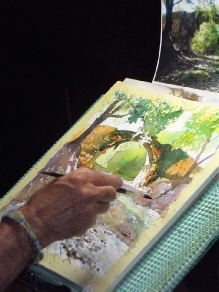 I was using a Block of Hahnemuhle 'Quatro' 140lb paper which is almost HP ( smooth ) with a slight tooth. I chose this paper because I did the drawing in ink and this paper is a joy to use with pen work. Here I am peeling off the masking tape border and that will be it ! At last night's packed meeting the members were privileged to see 'Herr Flick' aka Barry Herniman - in action. 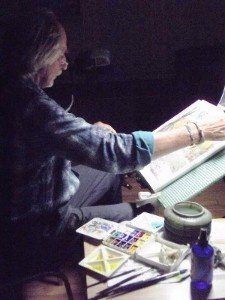 His love of transparent watercolour painting and light and shadow play was clearly demonstrated!! 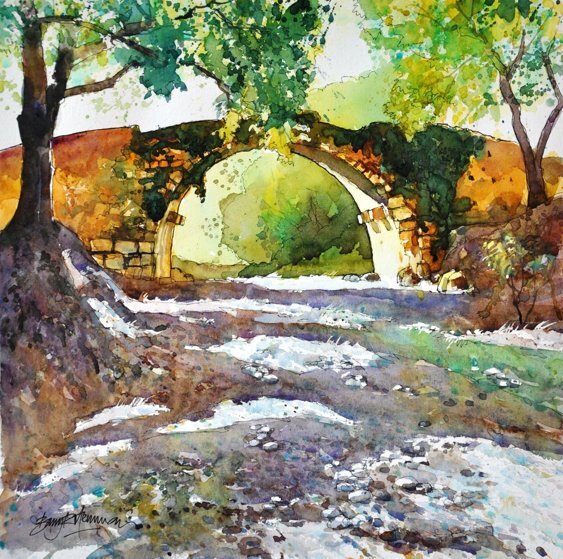 Barry shared many insightful processes on achieving a vibrant, light filled painting, by using only transparent watercolours and allowing the layers beneath to sparkle through!! Thanks Barry - a fabulous evening... again! !